Despite the heat I figured I could turn the stove on long enough to make an omelet and some filling for it. I had seen Ricardo make an omelet filled with bacon and fiddleheads that looked really good. It’s much too late for fiddleheads, but you can still find some pretty nice looking asparagus out there, so I subsituted some for the fiddleheads. Since I made this for one, I won’t give out quantities but here is a list of ingredients and how I put it together. I will say that two eggs are more than enough for me. Cook bacon until almost done in a small pan over medium heat. Add diced onion and sauté until onions are softened and the bacon is cooked. Add asparagus and cook until just reheated. Set aside. Whisk eggs with milk/water and salt and pepper. Heat oil or butter in a nonstick pan. Pour egg mixture into pan. When the edges are done, pour the filling onto one half of the omelet and then cover that with cheese. Fold the other half of the omlete over using a spatula. Asparagus AND bacon in one omelet! Oh my! That sounds divine! The omelet photo is superb! Nicely done! When I make omelets for Frank and I, I use 5 eggs. Let me say, they don’t look as pretty as yours! I will definitely have to try this combo! Gorgeous omelet! Mine always turn into scrambles because I get impatient and start messing with the eggs. 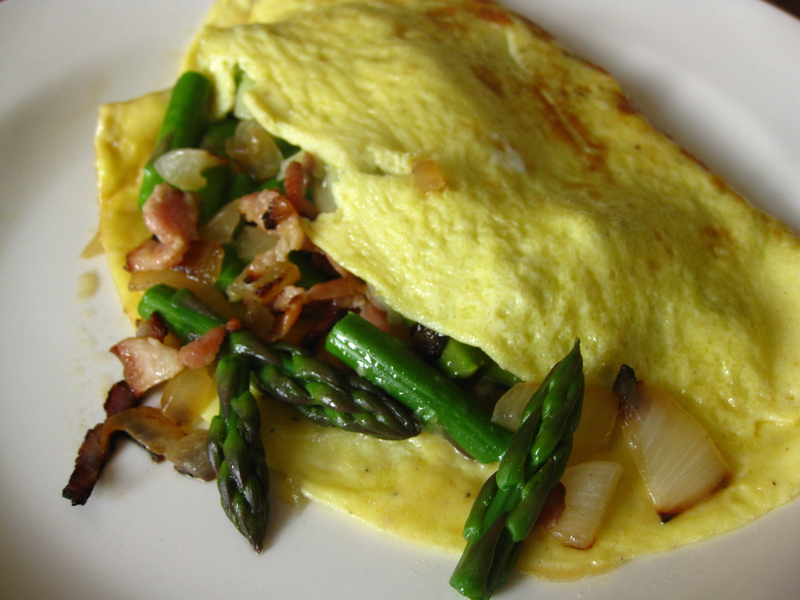 Omelets are still one of my favorite quick it in a pinch meals, this one is great with the asparagus and bacon filling. Bacon, asparagus, onion and cheese – oh my! Yummmy bacon and asparagus!!! So good together. Love the pic. Is it morning yet??? Thanks for checking out my blog and Yes, the Cataplana is awesome. Totally worth it! Thank you for sharing. I love omelets! And this one is a nice marriage of colors and flavors! Hurray for omelet day! This looks like a great brunch omelet! Looks like it was worth turning on the stove for! Wow… that’s a good looking omelet. So yummy and with crunchy asparagus, just perfect.